Fat contacts: starter spins (does not engage obviously). Solenoid contact: solenoid engages but starter doesnt spin. I can turn the motor by hand with a wrench on the crank, so its not locked. When I turn it I hear the starter solenoid click back in place. Ive cleaned battery terminals and earth contacts on motor. To me the symptoms are like its not getting enough juice but I have checked everything - i think! Question: is it possible for the starter to spin, no load but still be bad? But it might not necessarily be the starter motor itself that's faulty. 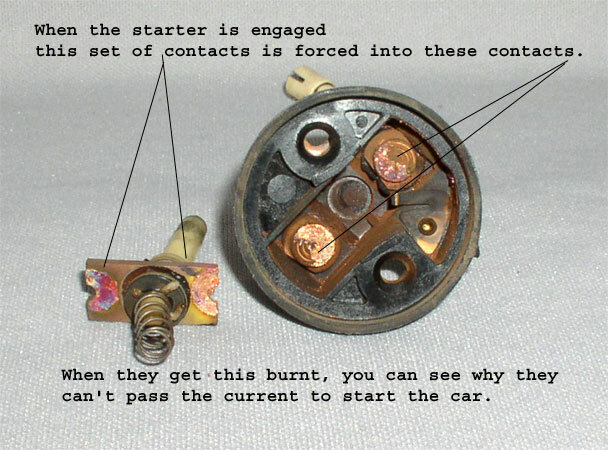 The other thing that will cause your symptoms is burnt contacts inside the solenoid cap. If you can bridge all three terminals on the solenoid together see if than makes it crank. If so it's the contacts inside the solenoid cap that have failed. You can often buy a replacement cap which comes with new contacts. Failing that you'd need to replace the complete solenoid. You need a new starter. I don't think it's going to be possible to buy as solenoid alone. ok, I replaced the starter and the bobcat starts now. afterwards I disassembled the old one to see if I could find the cause of the problem. The high current contacts in the solenoid are operated by a large copper washer being pushed into them to close the circuit. This large copper washer was filthy dirty with oily grime. The contact were also dirty. I haven't cleaned/repaired/tested it yet but it matches the symptoms so I'm pretty sure its solved. Thanks for taking the time to post back and confirm my suspicions. 1986 bobcat: starter fixed last week. worked for a while. now it only runs 1/2 hour before the motor gets slower and slower, then stops. Its a (ryobi?) 3 cylinder diesel with old fashioned fuel pump/discributor and gravity fed fuel tank. Sometimes it starts after I let it sit 1/2 hour. Sounds like it’s running out of fuel. Injector pump fuel filter on diesel are critical, any idea if it has been changed recently. Is it running winter or summer diesel. Could try fresh diesel fuel.